Ever wanted to become a surgeon but don’t want to spend a bazillion years studying for it? This game has you covered. You won’t spend a long time playing it, but each round is just fun in a twisted and sick way. Doesn’t matter, I enjoyed my short time with it. 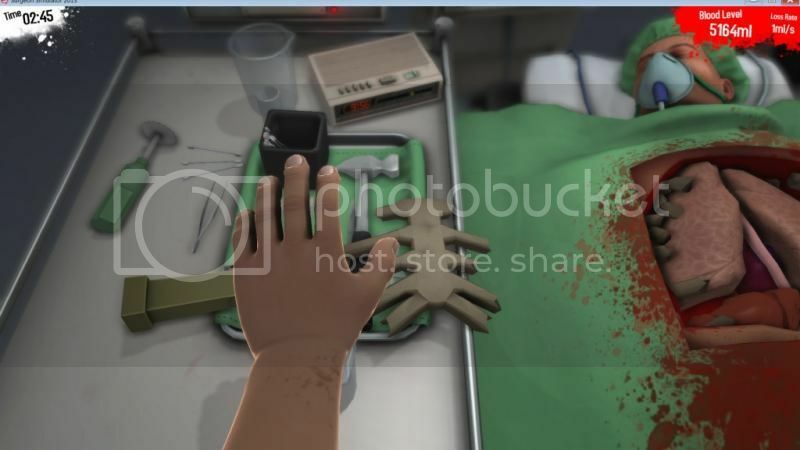 Surgeon Simulator (Platform: PC) was a game that was conceptualized and created within a 48 hour period. From Bossa Studios, they entered the Global Game Jam competition early this year to submit this. 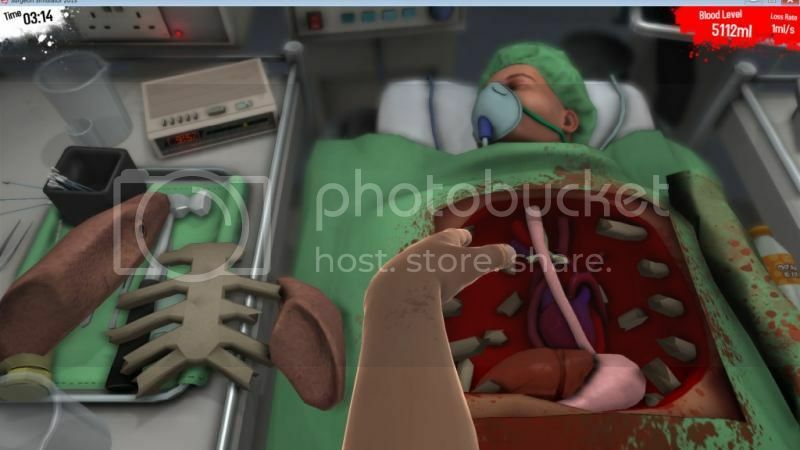 The team then continued development of Surgeon Simulator until they finally released it on Steam. 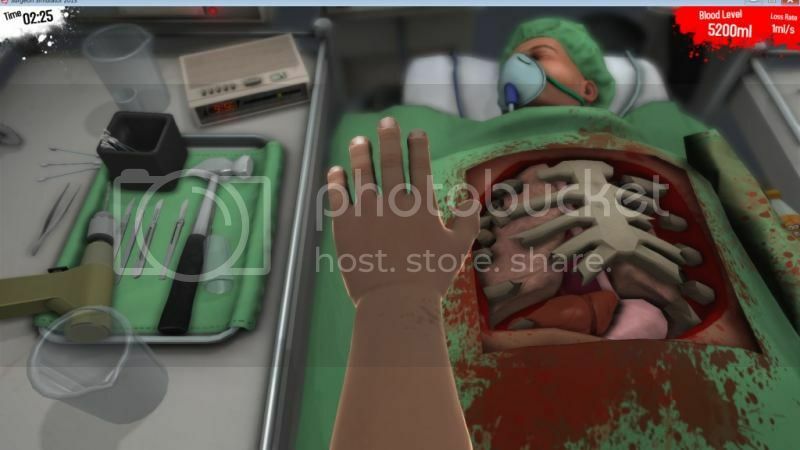 Surgeon Simulator puts you in the role of a surgeon who is tasked to perform certain operations. You win when you succeed and you lose when the person you are operating on dies due to loss of blood or some other condition caused by you. The tutorial teaches you how to move around. You do operations using only your left hand which is shown on screen. There is 1 button on the keyboard that corresponds to each finger (A – pinky, W – ring, E – middle, R – pointer, Space – thumb). Then the mouse controls where you move the hand. Left click moves the hand down, and right click controls how you twist the wrist. Ok, start operating. I have no idea how to do this. So I fumble around and try my best to pick stuff up, everything just falls around (some into the patient’s innards) including earbuds and cotton balls. I finally pickup a drill saw and saw off some parts of the ribcage in attempts of getting into the heart. Since I only use one hand to saw, the bone chips of the ribcage fall into the patient’s body. I was able to completely remove the ribcage, but made a boo boo when I accidentally dropped the electric saw. I try to pick up the hammer or manual saw but it’s too hard to do that without dropping move stuff inside the patient. I was able to remove both the lungs and only the esophagus and stomach lie between me and the heart. I used everything: power drill, incision knife, hammer, scissors and I just can’t the stomach off. 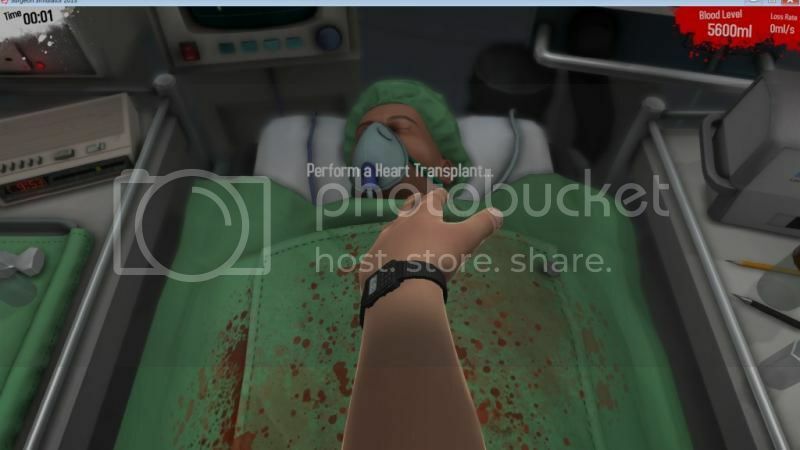 I take too much time and my patient loses too much blood and dies. That is the first level of the game. I don’t know what craziness the other levels hold. 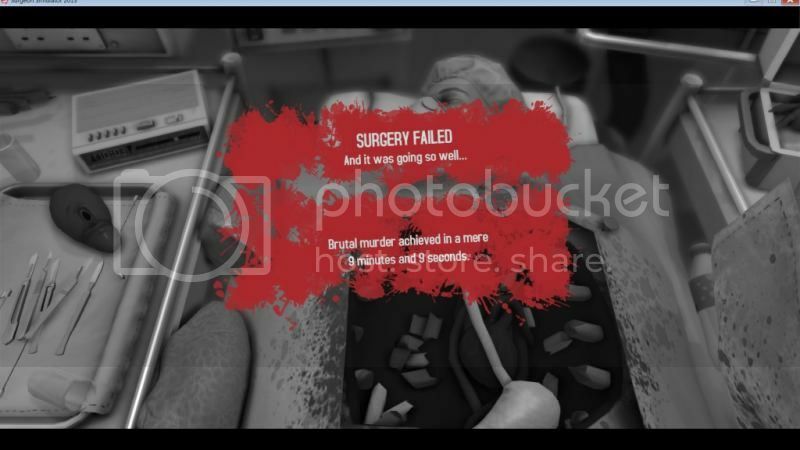 I had fun playing Surgeon Simulator 2013. It’s good if you have a few minutes to spare while waiting or on idle time. It won’t capture your attention for a long time so enjoy it while it lasts. Surgeon Simulator 2013 costs $9.99 on Steam.